Each year, the Blue Compass team enjoys a variety of festivities leading up to our anniversary, but this year we decided to give the celebration a new twist. 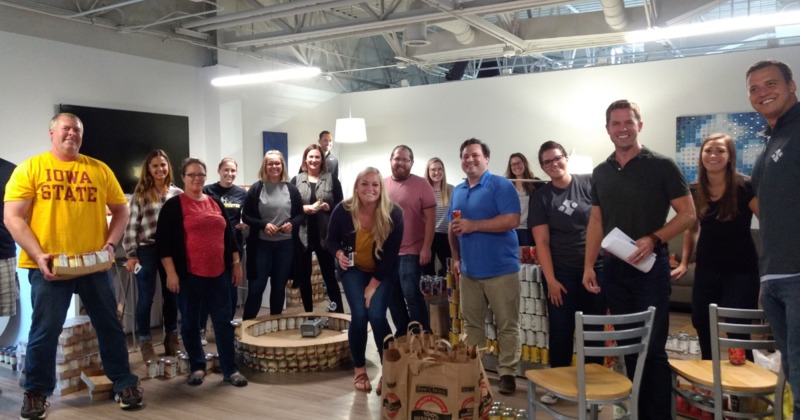 To give back and thank the community who has supported us over the last 11 years, we will be hosting an 11-day food drive running from September 18 to October 2nd, for the DMARC food pantries. For those of you who want us to get right to the point, here you go! Gather all the details you need to get involved with our DMARC Food Drive. 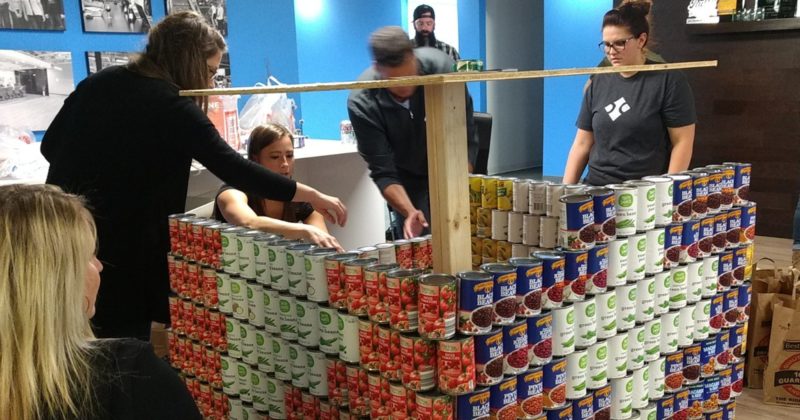 Get Involved: Drop off cans at our office, donate online, or vote for the best can sculpture! Voting: Visit our social media channels on October 2nd to see the results of our can sculpture face-off and vote for your favorite. Back in April, our team was already discussing how we could get involved and give back to Des Moines. We kept landing on a food drive as a way to say thank you to our community. In Des Moines, the need is real, and we thought Hunger Action Month was the perfect time to raise awareness. But that wasn’t our only reason for choosing to host this food drive in September. Often, food banks and shelters get a plethora of donations around the holiday season, and we wanted to help at a time of the year when contributions don’t come as steadily. In addition to asking our team for donations, we’re also asking you, the community, for your help making our food drive successful! We want our impact to be far-reaching, and we cannot do it without you. So how do you get involved, you ask? There are many ways you can help with our #BCTurns11 Food Drive. If you’d like to pick up some cans at your local Hy-Vee or Fareway, we’d be more than happy to store them at our office and deliver them for you. Be sure to check out the information about DMARC’s most-needed items and pick up a few. Drop by our office between September 18th and October 2nd and let one of our team members know you have a donation. If you don’t have the time to pick up cans, we’re also accepting monetary donations. Did you know, DMARC can buy more with a monetary donation that you could buy in the store for the same amount of money? Because they buy in bulk, DMARC has a higher purchasing power than the average consumer. 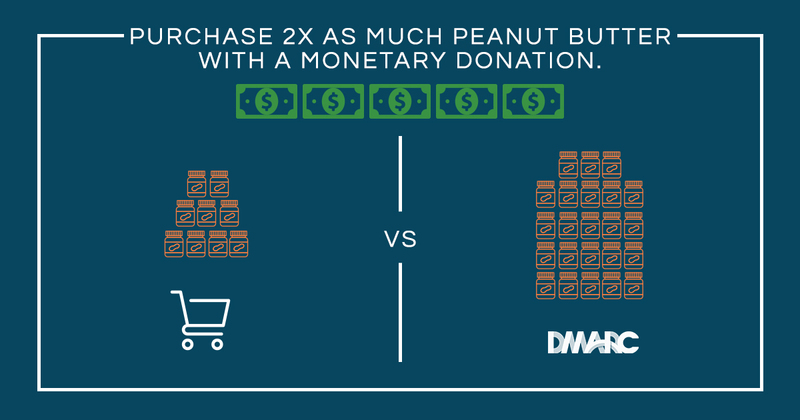 With $25 DMARC can purchase twice the amount of peanut butter and three times the amount of cereal you can buy with the same money. How’s that for making a difference. Every little bit helps to feed our neighbors in Des Moines, so head on over to our online form and leave a donation for DMARC! What do we mean by that? Well, we’ve got a little trick up our sleeves! 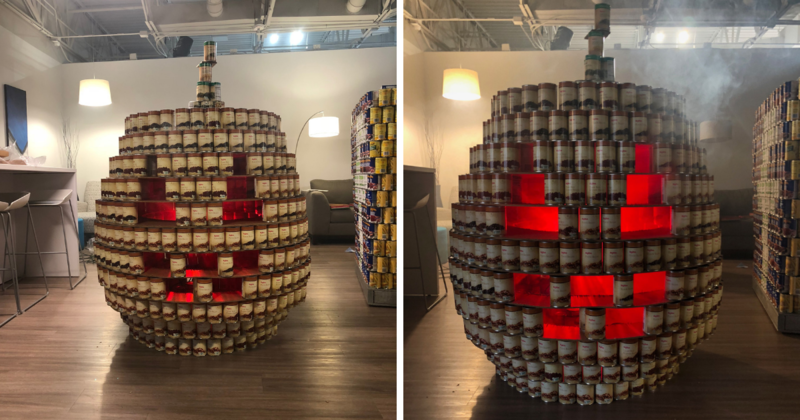 As a team of designers, developers and digital marketers we are always looking to add a creative spin on projects, so we decided to add another level of competition to this food drive. Our departments will be competing against each other to see who can build the best can sculpture, and the results are up to you! On October 2nd, after we have finished collecting donations and constructing 3D sculptures, we’ll post pictures to Facebook, Twitter and Instagram and ask for your votes. By getting involved on social, you can help us spread DMARC’s mission even further! 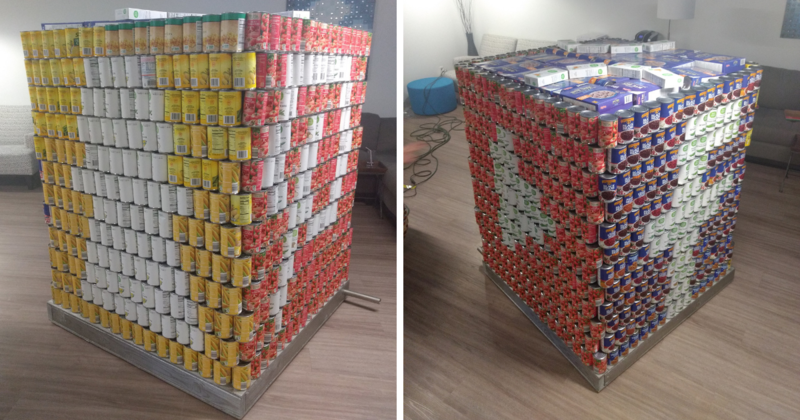 Be sure to check back to find out who won, and take another look at all of our can sculptures! We can’t say thank you enough to the Des Moines community for an amazing 11 years! We hope you’ll help us by sharing the cause and donating cans or money to help DMARC. Thanks to everyone who helped, we raised 1,472 cans, plus even more monetary donations, for DMARC! We could not have done this without the support of the Des Moines community. After collecting all of the cans, we had a great time breaking into teams and "canstructing" two can sculptures. Our teams built a pumpkin and a spinning social media cube, and you picked the pumpkin as your favorite! For those of you who didn't get to follow along with us live, check out our video and images of the fun day.